The Lottery will conduct five (5) drawings during the sales period of the game. In each of the five (5) drawings, one (1) Away Game Trip for Two (2) to Miami for 10 Years winner, sixteen (16) Super Suite Ticket Package winners; one hundred (100) Game Day Ticket Package winners; thirty (30) Chalk Talk Experience and Autographed Football Package winners; and ten (10) Front Row Ticket Package for Four (4) winners will be selected. 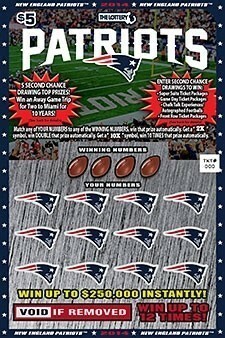 All Second Chance Drawing winners will be notified by the Lottery and must complete a claim form. Each Away Game Trip To Miami for 10 Years Package winner will receive: roundtrip first-class airfare for two (2) to Miami/Ft. Lauderdale, ground transfers at destination between airport and hotel and to/from game, hotel accommodations for two (2) nights (double occupancy) at the Patriots Team Hotel, two (2) game tickets for the New England Patriots regular season game in Miami for ten (10) consecutive seasons and $1,000 in cash. If the Patriots regular season away game in Miami is not played in the continental United States, the Patriots will provide the winner and a guest with a trip to another regular season away game during that season. Trip location will be chosen at the Patriots discretion. Total trip prize value is $144,286 (less applicable taxes and withholdings). Each winner will receive four (4) tickets to a Patriots regular season home game in a Gillette Stadium Super Suite, one (1) parking pass, food and beverage (alcohol not included) and $1,000 in cash. Total prize value is $7,500 (less applicable taxes and withholdings). Each winner will receive two (2) tickets to a Patriots regular season home game in the Lower Level Corner/End Zone or Mezzanine Level Corner, two (2) pregame tailgate party passes, one (1) parking pass, one (1) $100 Stadium Gift Card, one (1) football autographed by a 2014-2015 New England Patriots starting player, two (2) New England Patriot caps and $250 in cash. Total prize value is $1,626 (less applicable taxes and withholdings). Each winner will receive a football autographed by a 2014-2015 New England Patriots starting player, two (2) tickets to a Chalk Talk with a member of the Patriots coaching staff at Gillette Stadium and $250 in cash. Winner and one (1) guest will have the experience of learning the X’s and O’s of coaching, research, scouting and game-planning to prepare for an opponent each week. Prize includes a catered meal and a tour of Gillette Stadium. Total prize value is $1,579 (less applicable taxes and withholdings).